The other thread was more for the firing of Juan Castillo. Let's use this thread to discuss/analyze our NEW defensive coordinator, Todd Bowles. He was hired in January by Reid as a defensive backs coach, a job he seemed over-qualified for since he had been an assistant head coach/secondary coach for the Dolphins since 2008 and last year became the interim head coach for the final three games after Tony Sparano was fired. Bowles coached under Bill Parcells, first with the Cowboys from 2005-07, then, when Parcells took over in Miami, he brought Bowles with him. He started his coaching career with the Jets in 2000 before moving on to Cleveland from 2001-04. How did it all go down?? 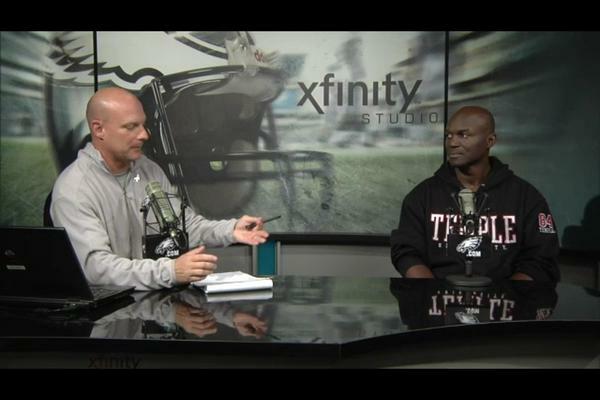 It was a normal morning for Todd Bowles. Got to the NovaCare Complex around 5:30 a.m., hit the gym for a workout with coaching colleagues Mike Caldwell and Duce Staley, then walked down the hallway to the cafeteria for some breakfast. That’s when Eagles head coach Andy Reid called him upstairs to his second-floor office, and suddenly it wasn’t a normal morning anymore. 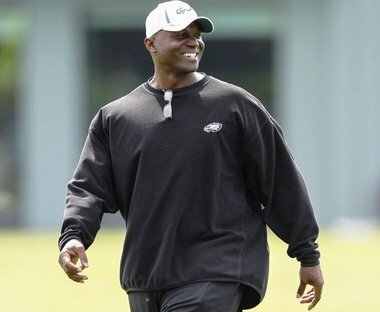 Bowles, a North Jersey native, a safety at Temple in the 1980s, an eight-year NFL veteran and long-time NFL assistant, becomes the Eagles’ third defensive coordinator since 2009. "We wanted another communicator for Juan," Reid said. "Someone he could talk to who has experience. That's why I brought [Bowles] here." "The 4-3 has been around a long time, and this is not a new system," Bowles said. "They put the ends a yard wider, and everyone thinks this is a new system. It's been around for a long time." What will be new for Bowles are his day-to-day duties and the amount of players he oversees. As the secondary coach, Bowles needed to worry about only the cornerbacks and safeties and did not spend much time preparing for running plays. Bowles said he's familiar with the entire defense and has been in meetings with the players throughout the season. When Bowles started working for Parcells, Parcells instructed Bowles to learn the entire system and all the players, not just the group he oversees. That way, he'd always be prepared if a change is made. Bowles heeded that advice, and now he's again in the spotlight after a change was made. I for one am excited to see what he brings to the table, even though the structure of this defense is already set in stone. From the minor tweaks, to sticking with a game plan that is working, to having the respect of the players. Looking forward to Bowles' new tenure as our DC. TB: We put the game plan together as a staff, I'll rely on them as I call the games. Same. I get a sense that Nnamdi really likes and respects him. I hope that means he'll finally be put in the correct position for the entirety of the game. Will be interesting after the next six games to compare what Bowles has done to what Juan did. Bowles has his work cut out for him with the Falcons, Saints, Cowboys twice, Rg3, and maybe Cam Newton (if he gets his act together) to go up against. It's been noted numerous times already, but I think the fact that Bowles has never been a DC will prove to have some growing pains. True...but he has more experience on the defensive side of the ball than both McDermott and Castillo coming into it, and I think his stint as interim head coach will be a big advantage going into it that the last two didn't have. And then he played in the league for 8 years which is another benefit he has that Juan and McDermott didn't, I gotta think that a guy who played and even started/won a Super Bowl has an xfactor he's bringing to the table. There will be some lapses though of course. So doing nothing but coaching DBs he went to Miami and became a secondary coach/asst HC? John Harbaugh went from coaching our Special Teams/DBs to having one of the best records of a Head Coache in their first 4 years ever in NFL history. One has nothing to do with the other IMO. JH comes from a family of coaches somewhat different IMO. I was merely asking how do you become an asst HC when you never had any experience coaching anything but DBs. Was that how Miami lured him from Dallas? I know Saprano was there with him during that time. EDIT: Maybe I just answered my own question. I was merely asking how do you become an asst HC when you never had any experience coaching anything but DBs. I would think having the respect of players and coaches go a long way, along with being a bright mind who is a former player also played into that equation. Much better expirience than Castillo, who's last work on the defensive side of the ball was a Texas High School in the late 80's. He got a scary face. I like that in a DC. 2 weeks before someone calls him "Todd Bowels"
Under. I called him that in the offseason before realizing the "l" came before the "e".